It is truly astounding that so many millennials have never heard of Adolf Eichmann (1906-1962); the architect of one of the most profound atrocities, visited upon mankind; Eichmann lived in a cocoon of normalcy until his capture in Argentina by Israelis (Mossad) in 1960; keenly complicit in the annihilation of six million Jews; he stood trial in Jerusalem; convicted and hung for war crimes against humanity, on June 1, 1962; “Operation Finale” should be seen based on its historical prescience; the Holocaust occurred and should be resoundingly taught to generations for eternity. Historian Hannah Arendt, a German Jew, born the same year as Eichmann (1906-1975), spent days visiting, dissecting, digesting his trial in Jerusalem, writing for The New Yorker magazine; “Eichmann in Jerusalem: A Report On The Banality of Evil”, published in 1963 earned its share of adulation and derision for her humanization of a colossal demon; director Chris Weitz follows empathetically Arendt’s portrait but with glimmers of heinousness hibernating beneath the banal. 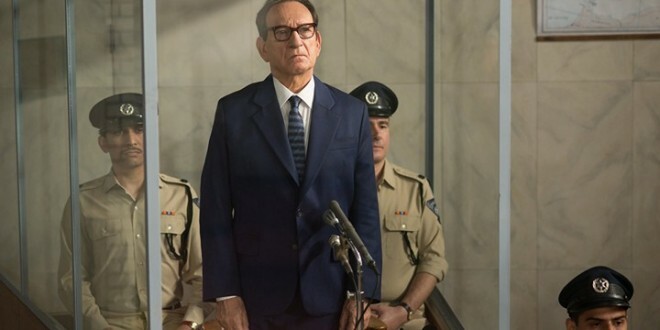 Ben Kingsley luxuriates in the role; his captors, sickened by his benign behavior; flashbacks of sins he perpetrated, slaughter of innocents, castration of a populace doomed by their beliefs; from Gandhi to Eichmann, Kingsley scores, soars. Oscar Isaac, brings to fruition and lionization, the genuine hero behind Eichmann’s apprehension, Peter Malkin; their taut scenes, seductively stunning; tussle of intellects, bordering on respect, tempting but never eclipsing the linings of iniquity woven between their cunning courtship. Legitimate supporting roles: Melanie Laurent, Michael Aronov, Greg Hill, Ohad Knoller, convince as Israeli agents; of particular interest is intensely watchable Lior Raz (“Fauda”) as Isser Harel, spymaster and director of the Mossad; Joe Alwyn is consummate as a Hitler Youth clone; anti-Semitism nurtured from father to son, Klaus Eichmann. Relatively unsung, now revealed, are father/daughter, Lothar and Sylvia Hermann (played perceptively by Peter Strauss and Haley Lu Richardson) the source for Eichmann’s unearthing. “Operation Finale” flawed, but paralyzes with the incomprehensibility of actions that defy justification, reason or humaneness; there are no answers, only perpetual, mystifying questions.